Do You Need Our Door Knob Repair Services? You get up in the morning and wander throughout your house, placidly breezing in and out of doorways without a second thought when thud! The one that resists you. You try, you try again, no success. 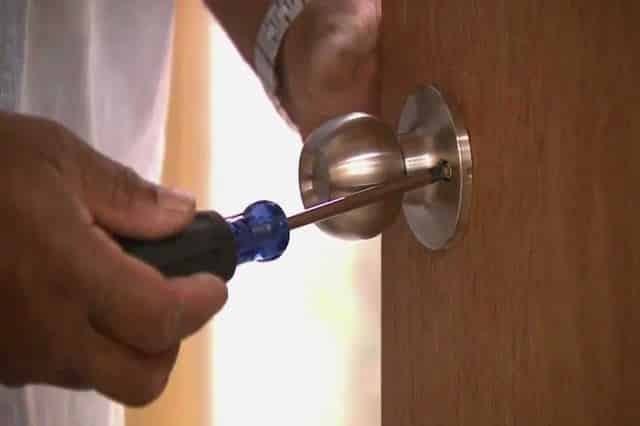 It is ripe for a Door Knob Repair San Diego but you just haven’t had a chance to ring your trusty locksmiths down the road. Instead you tug and push, simultaneously twist and jiggle, on the odd furious occasion you even test your martial art skills by karate-chopping the door, only to bitterly injure your hand, wrist, foot, and quite possibly that vase that you had standing near the entrance. At times like these it is time to conquer your nemesis, not under your own strength, which by now is probably all used up and you’ve worked yourself into a fury, but by the might of your finger; the one that dials the number of 7 Day Locksmith, San Diego, CA. We are no cowboys, that lock will surrender to us come what may. We have years of wonderful locksmith experience to back us up. No Door Knobs are too difficult or stubborn for us. Not even the one that you swear has been secretly laughing at you behind your back. Let us handle it. We will do a great job quickly and will even leave you a shiny door knob that functions perfectly in it’s place. What more can you ask from your friendly neighbourhood Locksmith?! Screws have been overtightened by non-professionals with electric screwdrivers. Internal springs have not got sufficient lubrication. The inside “neck” is binding to the door preventing the handle backplate from laying flat. The door has dropped, binding the latch bolt against the keep plate. The spring in the mechanism was cheap and has failed, we are sorry, come to us for a better quality latch. The most common varieties of Interior Door Knobs come in all shapes and sizes but usually have very similar mechanisms on the inside. 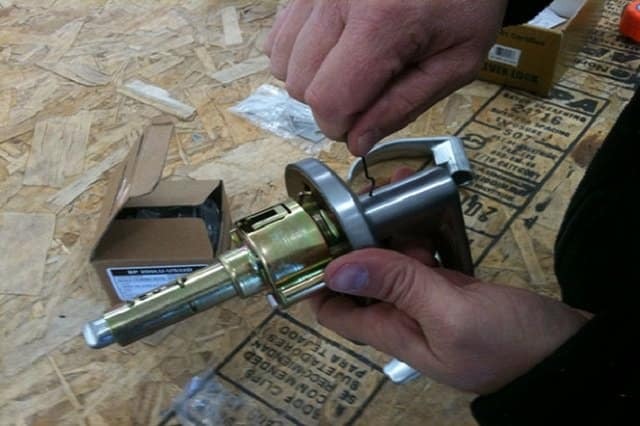 Usually when you turn the knob, it pulls a cylinder, which is connected to a spindle or bolt, pulling it in the same direction. Turn the knob, the latch bolt is retracted into the door, let the knob go and the reverse happens. The spring returns the latch to it’s original state, protruding proudly out of the door, or hidden inside the door frame. The square or rectangular backplate can host a variety of different jobs. If you want a keyhole cover, where are you going to put it? On the backplate. Locks can be placed through and inside the backplate, with the keyhole for functional use. If it is a bathroom lock, you can have your backplate adorned with a turn and release knob, the kind that is most compatible with a bathroom lock. Or you can have a simple latch lock which allows the backplate to be plain. You see, there is more than meets the eye with our Interior Door Knobs. But let us worry about the mechanisms while you browse the aesthetic features; do you prefer a brass, brown mineral, wood, Victorian bronze, cut glass or white porcelain door knob to replace your arch-rival? Call for our Door Knob Repair service today and we will sort your difficult door knob problems out in the same day or night, if that’s when you want us. You will not feel sad when you replace the offending article that probably caused you way more trouble than it was worth, and put a shiny new one in it’s place. We will have you breezing through your door ways once again as our highly trained professional team get on the job. You have round the clock service from Locksmith San Diego, and you will never have to wait long for a response as we are in almost 70 addresses in San Diego, CA, alone. We are sure that you will love our range of interior door knobs as you browse through the desired aesthetics available. You may even feel tempted to break your other door knobs to be able to change to that complete set of new, functional, highly stylish knobs that you have had your eye on since the last time you used our services. We will not judge you if you want to replace a perfectly healthy door knob for the sake of interior design, on the contrary, changing a functioning door knob is cheaper and easier to do than repairing a problematic one. Call us today and get a free quote for door knob replacement or any other service. It’s the little changes in life that can sometimes make us smile the most, let this be one of them.